Rule-1 Adjective of quantity like much, LITTLE, ENOUGH, SUFFICIENT, WHOLE, etc. must be used with uncountable nouns only as they express quantity and not number. Ex.-Many (not much) boys are absent from the class today. Many (not much) boys failed in the examination. Rule-2 The use of ‘few’, ‘a few’ and ‘the few’ should be used with care they denote number. Few means ‘NOT MANY’. The few means ‘WHATEVER THERE IS’. Ex. I read few books. I Read a few books. I Read the few books I had. Little means ‘hardly any’ in quantity. A little means ‘Some’ in quantity if not much. He had a little money. The little means ‘not much in quantity but all that is’. Ex.-I spent the little money I had. Rule-4 Adjective of number must be used only with the countable nouns and not with uncountable as they indicate number and not quantity. Rule-5 Some, All, Any, No. Most etc. may be used both as adjectives of number and Adjectives of quantity as they can express number as well as quantity. Rule-6 the comparative adjectives, ending with like superior, inferior, senior, junior, prior, anterior, posterior, exterior etc. Take ‘to after them and not ‘than’. Rule-7 Double comparative adjectives or double superlative adjectives must not be used. (incorrect) He is more senior than me. (correct) He is senior to me. Rule-8 Comparative degree must be used when the comparison is between two persons of things and superlative degree when the comparison is among more than two things. Rule-9 The comparative ending in ‘er’ is not used when we compare two qualities in the same person or thing. In that case we use ‘more’ before the Adjective. Delhi is farther from Haridwar than Roorkee. Rule-12 Before superlative adjectives articles ‘THE’ must (always) placed. Ex.-He is the best boy of the class. She is the most intelligent girl. Ex.-He was sitting next to me. Patna junction is the nearest to my house. Elder and eldest – are used of members of the same family. Older and oldest are used for persons or things. He has less money than I.
Rule-16 Some adjectives like (Perfect, Ideal, Full, Chief, Unique, Complete, Infinite, Extreme, Entire, Universal, Empty, Impossible, Unanimous, square, sound etc. are not compared as they express meaning which do not admit of any variation of degrees. The tiger is as swift as any animal. The tiger is as swift as any other animal. Rule-18 ‘Each’ is used to indicate a limited number and ‘EVERY’ to denote an unlimited number in selection or choice. Rule-19 "Some" is used in the affirmative sentence "any" is used in negative and interrogative sentence. Did you go somewhere last night ? Did you go anywhere last night ? 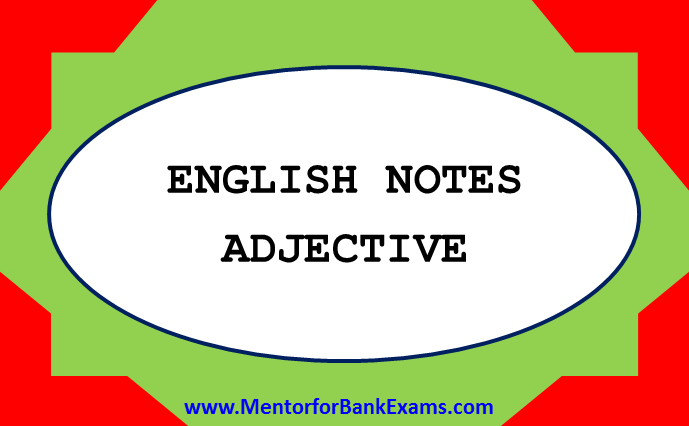 Rule-20 What’s the Correct Order for Multiple Adjectives in a sentence? 3. Quality or opinion: Explains what we think about something. This is usually our opinion, attitude or observations. These adjectives almost always come before all other adjectives. 4. Size: Tells us how big or small something is. 5. Shape / Weight / Length: Tells about the shape of something or how long or short it is. It can also refer to the weight of someone or something. 7. Age: Tells us how old someone or something is. 8. Colour: The colour or approximate colour of something. 9. Pattern: The pattern or design of something. 10. Origin: Tells us where something is from. 11. Material: What is the thing made of or constructed of? 12. Purpose/Qualifier/Use: What is it for? These adjectives often end in –ing. This is the correct order for adjectives that come directly before a noun, and they are separated by commas. Ex- My beautiful, big, circular, antique, brown, English, wooden coffee table was broken in the move. For example- My coffee table is beautiful, big, circular, antique, brown, English and wooden. Ex- I love that really big old green antique car that always parked at the end of the street.